The next round of the Summer Olympic Games will take place in Tokyo, Japan. It will be the 32nd Olympiad and the second time that Tokyo has won the honor of hosting the world’s oldest and most respected sports competition. Being the summer games, the 2020 Olympics will put sports such as running, swimming, and weightlifting in the spotlight, continuing a tradition that started centuries ago during the first games in Greece. However, there are dozens if not hundreds of new sports that have been invented since the Olympics were a glorified wrestling match. In recent years, many people have begun to wonder if it isn’t time for the Olympic Committee to consider updating the roster with some more modern events. As manufacturers of the Octopit, the first piece of sports equipment specifically designed to make it easier and safer to play the game of gaga ball, we are big fans of alternative sports. Not everyone finds joy in playing baseball, and not everyone is capable of playing football. Gaga ball, on the other hand, is a sport that just about everyone, regardless of age or athletic ability, can enjoy. To some, gaga ball may sound like a made up game, but it’s definitely not! Created in the 1970s by school children who wanted a fun outdoor game to play that didn’t require a lot of expensive equipment, gaga ball has taken the world by storm. Keep reading to learn about more games (real and fictional) that we believe deserve a place at the Olympics, as well as why we believe gaga ball belongs on that list! Quidditch – If you’re a Harry Potter fan, you already know what game we’re talking about, but just in case magical young adult fiction isn’t your think, we’ll explain. Quidditch is like a combination of soccer, hockey, and polo. And oh, did we mention that it’s played by wizards flying brooms approximately 100 feet off the ground? Definitely an Olympic caliber sport. Skateboarding – OK, back to real life. 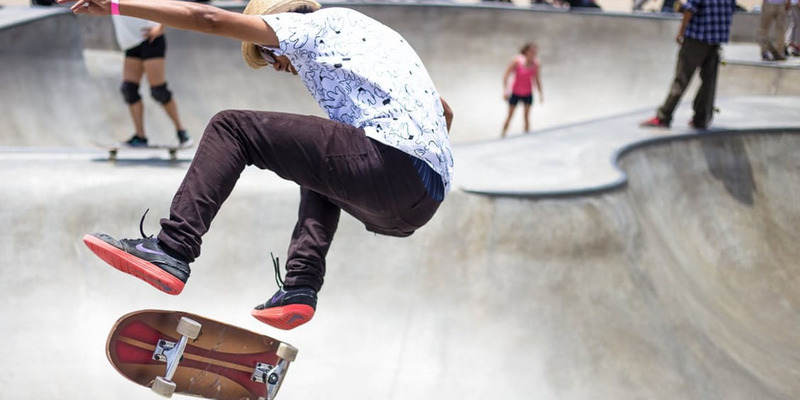 Skateboarding is an immensely popular sport, practiced by amateurs and pros all over the world. Professional skateboarders are nothing short of real-life wizards, using a small board attached to wheels to jump, flip, and grind their way over any obstacle in their path. Think of all the young viewers you could attract to the Olympics if you included a sport that was created in their lifetime. Croquet – Want to bring a little elegance and sophistication back to the Olympic Games? Introduce croquet as a competitive sport. Not only would the uniforms be fantastically fun (we’re envisioning some sort of dresses with puffy sleeves for the women and jodhpurs for the men. The sales of croquet sets around the world would skyrocket! Surfing – If you’ve ever watched even a few moments of a professional surfer at work, you know that this deserves to be an Olympic sport. Using nothing but a board and the power of the ocean, surfers are able to ride waves of an incredible size–and boy do they look cool doing it. The only problem would be that the Olympics would have to be located in a country with a natural coastline that’s suitable for surfing. Gaga Ball – Of course we would love to see gaga ball included in the Summer Olympics! It combines so many of the other skills that make Olympic sports exciting–jumping, dodging, swinging, kicking… and the best part would be that it would cost almost no money in setup costs. Compare to running and swimming, which require the construction of massive arenas, gaga ball could be played indoors or out. All they would need is an easy-to-set-up Octopit and a ball! Become A Sports Pioneer When You Buy Our Gaga Ball Pit! We hope you’ve enjoyed reading our wish list of alternative (and fictional!) sports that we wish would be included in the Summer Olympics some day. Although we may not be able to convince the Olympic Committee of its viability, that doesn’t mean you can’t enjoy the fun of gaga ball all on your own! Be a sports pioneer when you introduce this revolutionary game to your family and friends. Contact us today to learn how easy it can be to hold your very own Gaga Games by purchasing an Octopit.